When will you see BIG Y results? I have never had a shortage of cousins – particularly on my maternal side of the family. My mother was one of 14 Adams siblings who survived infancy. These included 10 girls and 4 boys. A 5th boy died within a few days of birth. My mom was the last surviving sibling when she died in 1998. It was interesting that of the 39 offspring these 14 produced, 18 of them were from the two oldest children. I think the timing of the Great Depression may have had as much to do with this difference in productivity as birth order but that is just speculation on my part. The pedigree chart posted by this individual did not help me place this cousin among the twenty-five thousand or so individuals I currently have in my family tree database. The DNA information did not tell me whether this match was on my maternal or paternal side. However, the geographic locations in the pedigree chart of the “new” cousin strongly suggested this match was on my mom’s side. I believe ancestry.com is correct, but the exact connection may be difficult to pin down. I was born 27 September, 1932, and adopted at birth by the parents in my ancestry.com family tree. The doctor who delivered me was Dr. G. W. Carpenter, who I believe had an office in Utica, MO, at the time. Most of the people who had first-hand knowledge of my birth are now gone. I was reluctant to make inquiries that might embarrass anyone. A neighbor who grew up near Breckenridge vaguely recalled that my father was an Adams employed in a grocery store in Breckenridge, and my birth mother was a young employee. As time permits, I'll try to find out more. Only one other family member has been tested to my knowledge. That is a first cousin -- once removed who agreed to be tested so that I could establish the paternal haplogroup of my maternal (Adams) grandfather. My DNA sample establishes my paternal (Dowell) grandfather's Y-chromosome. 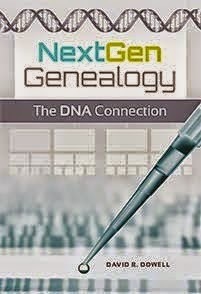 Merrill's DNA had also been processed through the FTDNA Family Finder test. It occurred to me that my new cousin "Joe" would be Merrill's uncle if Merrill's grandfather, my Uncle Frank, was also Joe's father. If instead Joe's father was one of the other Adams brothers, Merrill would be Joe's first cousin -- once removed. That is the same relationship I have with Merrill. Since Joe had tested at Ancestry and Merrill at FTDNA, they had to be placed in the same database in order to analyze the nature of their relationship. Therefore, Joe downloaded the raw data from his test at Ancestry and uploaded it to GedMatch.com a free site that among other features allows autosomal results from a variety of labs to be compared with each other. I downloaded Merrill's raw data from FTDNA and uploaded them to GedMatch. When Joe's results were compared with Merrill's, they shared about the same amount of DNA as I shared with Merrill as a 1st cousin -- once removed. An uncle would have shared much more with a nephew. Therefore, my Uncle Frank is also Joe's Uncle Frank and is eliminated as a candidate to be Joe's father. I talked to a first cousin who would have been six when Joe was born. She said she "had a feeling" that she had heard Uncle Bud might have had a child with a woman other than his wife. Even if he did this does not prove the child was Joe. Actually, we need to remember that the DNA results viewed to date do not eliminate the possibility that it was Joe's mother (not his father) who was his Adams connection. However, circumstantial evidence suggests that we are looking for an Adams father. 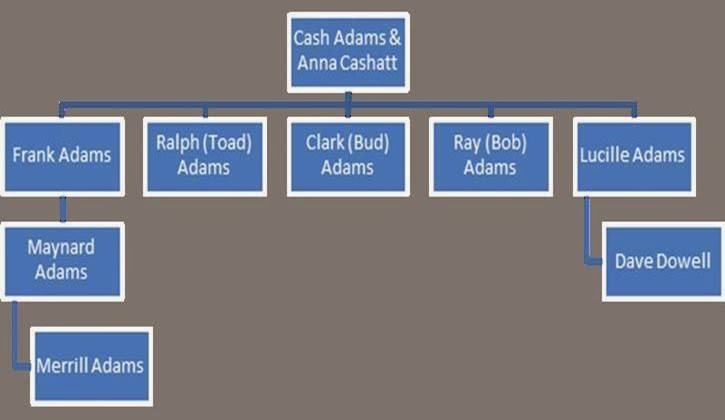 Our search is now focused on the three Adams brothers other than Frank. A child of one of the three (who is also one of my previously known Adams 1st cousins) has agreed to test. We should know that result sometime in February. Of the remaining two possible fathers, one never married and has no known descendants. We will be tracing the descendants of the other to see if we can find one willing to test. When will we see the beginning of the SNP Tsunami from the large number of BIG Y tests many of you have ordered? I'm in batch 542 (see blog earlier post) which was originally predicted to be returned 12/31/2013. What great fun it would have been to decode Y-SNPs on New Years Eve! This predicted date on my FTDNA page -- as many of you probably know -- has now eroded to 2/28/2014. The FAQ on FTDNA’s site has always said a less specific February, 2014. FYI: When a kit is batched it automatically gets an expected results date. Unfortunately, it is batch-specific, not test specific. There's not currently a mechanism to set that message by test type until AFTER it's been batched. For example, everyone knows that a Y-12 will get results faster than a Y-111, yet both get the same expected results date if they're batched at the same time. Since everyone who ordered Big Y already had testing done with us, the orders batched each Wednesday as usual, even though the test has not begun running yet. Consequently, those Big Y tests got the same expected results date as all the other tests in the batch. With regular tests, we don't know that the whole group of tests will not be ready at the end of that expected results dates, but with the Big Y we did, so rather than wait until the end of the block of time, we arranged for those dates to be changed up front to help mitigate some of the potential for frustration over the test not being completed by that initial date. Normally those dates are updated the day after the expected date, but in this case there was reason to wait until Jan 1st, etc. to make the change. Good news for Big Y! I was at FTDNA yesterday and Max has told me that they have the first successful runs in house completed. He didn't say on which machine they were running (MiSeq or HiSeq) and he didn't comment on possible barcoding problems, but this gives us hope that some customers may not need to wait until next year to see their results. We have also discussed the transfer of customer samples. It is important that those who want their samples transferred need to contact Max directly (max@genebygene.com) because apparently a commitment from the FTDNA customer support is not sufficient. However if Max approves them himself, then there doesn't seem to be a problem that samples can get transferred. Usually 50ul are sufficient. However if there is a way to get a new sample, then both companies would prefer that method instead of a sample transfer. Only samples that cannot be re-done or where laws prohibit taking a new sample should consider the transfer. Also good news for FGC customers: YSEQ has returned the first results to our customers today. Most of the FGC markers could be confirmed right away with Sanger sequencing. It seems that Greg has done a very good job with analyzing the data. In addition to that we have kicked out a bunch of SNP candidates on repetitive and X homologue sequences during the primer design phase, so that the remaining FGC markers were almost all a hit on the first try. Especially I'd like to point out the FGC5496 marker for R1b-DF13 researchers because it has also been confirmed in another sample of the 1000 genomes project. This marker is available at http://shop.yseq.net/ already. If you aren't confused yet, you haven’t been paying attention! Let me know when you get your results.